Location: The Black Sea Rama is the first Bulgarian resort with a professional 18 holes golf course and a breathtaking view towards the sea. The resort is located about 7 km from the town of Balchik on the way to Kavarna. 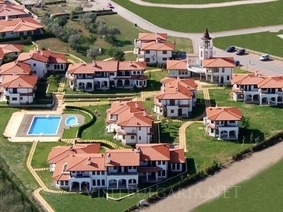 The complex offers 30 luxurious villas in Mediterranean style. Some of the villas are located in Bell Tower complex, offering 12 two bedroom villas and 5 luxurious villas with 3 bedrooms, each. Guests of the villas can use an outdoor swimming pool. The Bell Tower villa community is located on the southeast corner of the development just on the edge of the cliffs overlooking the Black Sea. The private deluxe villas are situated right next to the Bell tower complex. Each one of them offers 4 bedrooms, individual swimming pool, garden or a yard. All villas offer magnificent view towards the course or the sea. Comforts in the villas: All villas offer fully fitted kitchens and living rooms with plasma TV’s, telephone, mini bar and even fireplaces in some of the villas. Situated next to the Club House, the Club Residence studios and suites offer its guests stunning sea views on the south and relaxing golf views, overlooking 9th green and the BlackSeaRama Club House on the north. All studios and suites are fully furnished and equipped. - Buys and Food Orders Delivery. Sports & leisure: the complex offers a modern spa centre, sauna, massage studio, indoor swimming pool and fitness centre. A modern tennis court is also available at guests’ disposal. Conference facilities: Black Sea Rama golf and villas offers a modern conference room for business events and seminars.